A coworking space is a shared working environment with an infrastructure unlike the traditional office workspace. These spaces usually have open-plan layouts to facilitate free movement and flexibility in modern work style. Coworkers are often startup founders, but may also be freelancers or local entrepreneurs. Everyone, however, is tied together by their ambition to succeed and the desire to work how they want, when they want. There are more than 400 Coworking spaces in Bangalore choosing best co-working spaces is a challenge for any Startup company. Coworking spaces with Pocket Friendly Pricing. In any Startup company budget need to be used in a very calculated & organised way. Choose a coworking spaces where it fits your budget. Depending on the employee numbers pick a space accordingly. Never invest huge money on renting office. The most important tip to be taken into consideration is a location of Coworking spaces . Location should be surrounded with good coffe shops & restaurants etc. Location should also have good connectivity & easy for the employee to commute. 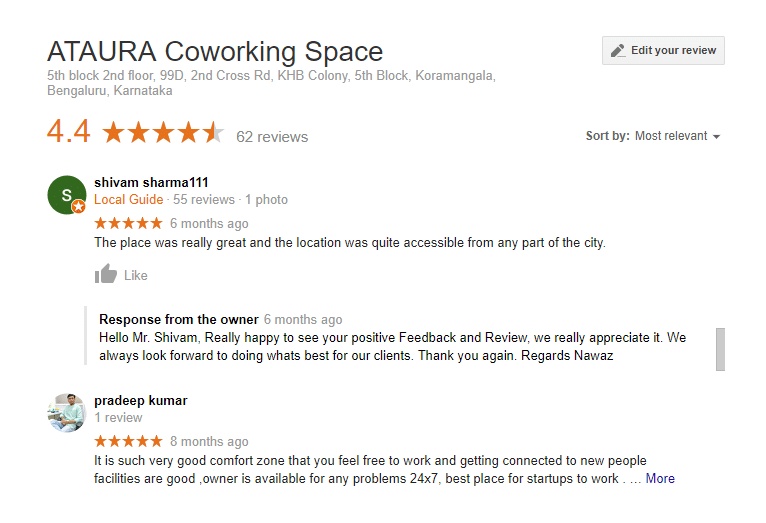 But in a city like Bangalore finding best coworking spaces in best location is difficult. But need to have more patience & spend more time finding one. When finding a coworking spaces the infrastructure plays a important role however the positive vibes in office is very important for effective work. Working environment should be well equipped or with classy amenities like AC, UPS Backup good internet connectivity, employee parking facility, good furnitues, play area, smoking zone & pantry. Startup Events or Entrepreneur gathering. Its always good if coworking spaces conducts a get togather meets & startup meets or events like entrepreneurship etc. Where startup company can build their network. Building network is key to startup company success.